In case you haven’t noted Roger Dudler from http://eclipsecolorthemes.org/ started to develop a dark theme for Eclipse 4. It already looks awesome. I assume it will be available soon. 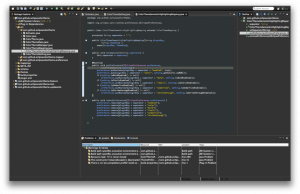 You may think, “woh, styling the Eclipse 4 IDE must be really, really difficult“. In fact it is really easy, at least from a technical perspective. Of course making it beautiful is a difficult art and Roger is making a great job here. But if you want to play with it, you only need to write a plug-in, create a CSS file and use the org.eclipse.e4.ui.css.swt.theme extension point to point to your file. If you export your plug-in, place it in the “dropins” folder of your Eclipse installation and your styling is available. The “ugly red” styling below took me approx. 45 seconds to create. What you are waiting for? Make your Eclipse 4 beautiful based on your own standards. See Eclipse 4 CSS Styling Tutorial for an introduction. This entry was posted in Eclipse and tagged CSS, Eclipse. Bookmark the permalink. 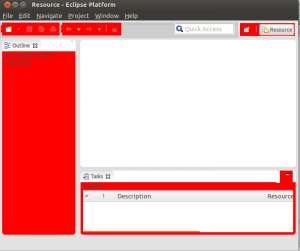 Power of the Eclipse 4 App Platform exposed. Is it really interesting for end point customers? Only few multimedia type applications need styling. In common OS related styling is clearer for application understanding. I prefer customize OS look and feel and all applications have to be same. From one point of view styling is interesting, but from other point we have now ugly and slow UI in eclipse 4.2 as result. Because some people keep complaining and never contribute back. Don’t get me wrong, having this possibilities is great. Regarding contributions: just search for “gtk default theme” in the eclipse bugzilla. I am not a designer, but I can tell you if something looks ugly. @fn Don’t get it personal. I didn’t say you can’t tell ugly from beautiful. Just don’t tell it to me, as ugly is a very relative thing, your ugly may be my beautiful. To me it’s no big deal, I don’t go sightseeing in Eclipse. If it gets unusable I’m pretty OK with your distress and filing bugs (I ain’t searching bugzilla for “gtk default theme” (don’t have time for this 😉 )) but arrogantly pretending things is a different thing from asking it. Telling people “Hey, why have your years long efforts resulted in something so ugly?” is not going to help anybody, especially when you are active part of that community. In open source you ask for things, not pretend. If you’re not happy with what you get report it, if you have time contribute back. If you have no time, deal with what you got but don’t arrogantly criticize like you own the world. Constantly saying it’s ugly even when someone blogs about how easy it is to change it is not going to help anywhere and anything. I would not call it “arrogant” to say it looks ugly – just search the web/bugzilla (if you have time 😉 ). It is just a missed opportunity because, in my opinion, all the great work in the background is overshadowed by this presentation (at least on linux). And these reports and discussions did not start just after the release, they started a while back. Ok, linux might not be the main focus point. The title is absolutely misleading: it should read “Eclipse 4 is could bebeautiful – but now everyone is enforced to create own Eclipse 4 theme”. There were lot of responses to my blog “I hate Eclipse 4.2 look and feel” (http://www.jroller.com/andyl/entry/eclipse_3_8_vs_4) and most of them simply confirmed that the default theme is just ugly and not professionally made. So again, here you are talking about possibilities the technology offers (e4) bit not about the end user product (Eclipse IDE 4.2) where none of those possibilities were properly used. @Andrey: Eclipse is beautiful as it allows you to adjust these things. 🙂 Just remember how long it took you to change the MRU behavior in Eclipse 3.x. Now you could do it in a few minutes. the answer is typical: “it allows…”. But none of my colleagues are going to program their own themes for Eclipse even if 4.2 allows us, never ever. The biggest part of the millions of the Eclipse IDE users are … just users, surprisingly. The fact that some of them could craft a useful CSS theme for 4.2 doesn’t mean that Eclipse shouldn’t have a nice and useful default theme. Yes, we all like technology (otherwise we wouldn’t be developers), but almost all of us use Eclipse not because we like it but because we must use it to get the job done. And the job for almost all of Eclipse users doesn’t include such funny things like programming new CSS themes for the IDE, even if it is now much easier as before. I cannot imagine to sell a product with such ugly UI for any of my customers and told them: “with the new technology you could program any UI theme you like”. I mean, they will simply return it back and say “sure, thanks, but please do your home work first, we need something we can use, not something we can program”. Non developers or people without time could use themes created by other. For example you might want to try the new dark theme: https://github.com/eclipse-color-theme/eclipse-ui-themes And with the help of these people, I assume the default theme will also improve over time.